In the end, it was a darkness different than the pre-dawn trip to Assateague that enveloped me, and haunts me still. Ten hours earlier I knew nothing of the cries. 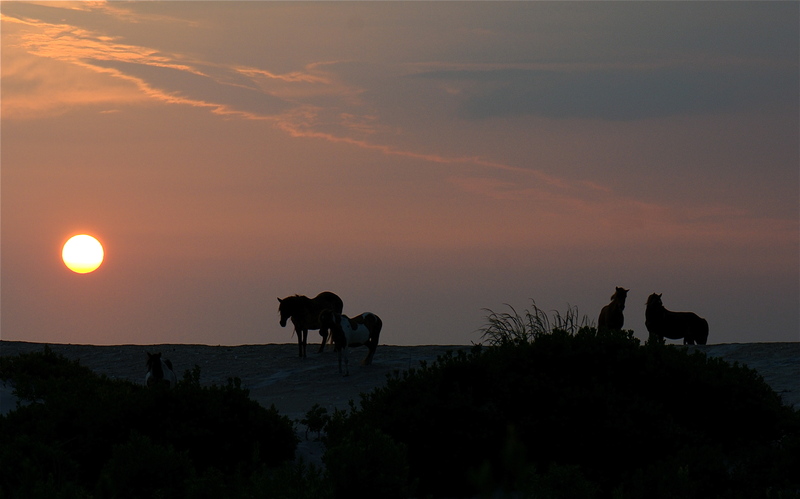 When we stepped outside of the bayside condo to head south toward the national seashore, the black sky brought nothing but a humid, cool breeze and a hope to capture the wild horses silhouetted against a rising sun. A tall order for any photographer, really. We do this all the time. We get an image in our mind of what we want to capture, paint the scene over and over again on our creative canvas, dreaming of colors and compositions that create impossible scenarios when we are working with so many variables beyond our control. We do it anyway, and we learn that it’s only through patience and tenacity that sometimes, though rarely, we are treated to the magnificent materialization of that craftily detailed mind-canvas we’ve been working on for days, perhaps even months or years. For this photo shoot, the mind-canvas was layered with countless images of horses against magnificent backgrounds, most of which were inspired by my daughter Madelyn and her illustrations. It wasn’t until I saw my friend Kim’s photos of the wild ponies at sunset that the images were complete in my own mind. Sunrise. Wild horses. Silhouettes along the ridge line. A blend of warm–cool colors that suggested a nearly unspeakable calm, a reverence for what goes on in the rest of the world as we push on, putting ourselves through the grind of hard labor to get and spend, get and spend. 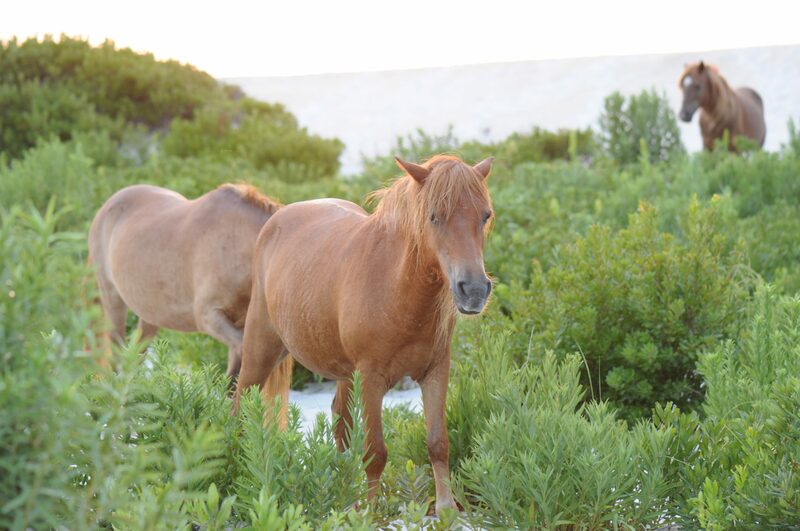 When Brad and I arrived at the island, still nearly 50 minutes before sunrise, we drove immediately to the southern tip to see if any horses were on the beach. We pulled into the parking lot among a dozen or so cars, and within seconds we saw a golden glow pulsing just over the dune. Sunrise already? It seemed impossible to think that the charts would be off by seconds. But 45 minutes? Simply beyond impossible. We unpacked our gear and set out for the beach. As we marched closer to the the top of the dune, we realized that the early sunrise was actually a pre-dawn bonfire, where about 20 people stood around laughing, staring into the large orange pit. We took a quick look north, then south along the shore — no horses in sight. With the invisible sun already lightening the deep blue skyline, we headed back to the Jeep. 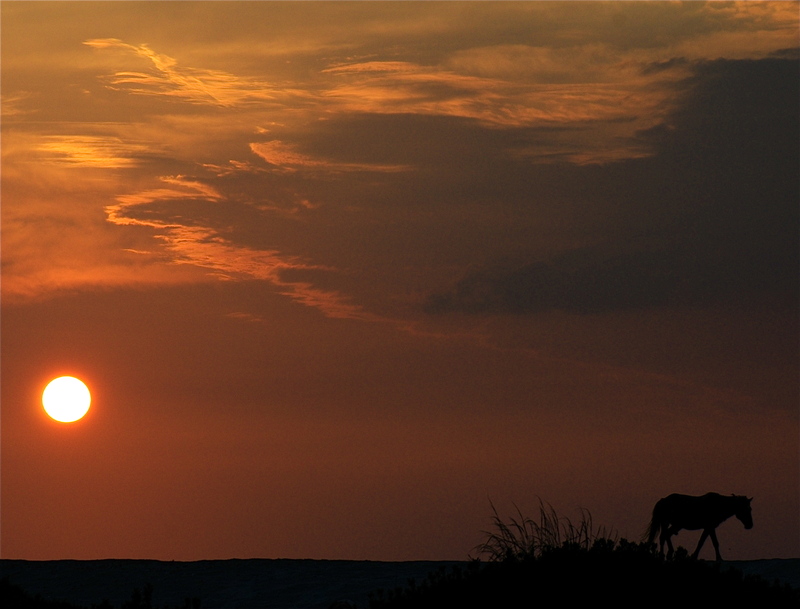 Suddenly, there was little time to find the horses, set up the shot, and wait for the sun to break the horizon. We had no luck finding a single horse anywhere. With the sunrise just minutes away, we decided to head to the marshes and see if we could get a few good shots with the ponies in the shallow waters. We walked briskly through the still, stagnant air and along the meandering boardwalk, swatting at black flies and mosquitoes that were thrilled with their own early-morning find. We reached the observation deck, struck with the natural beauty of the marsh, where water and grasses battled for space like a pair of old sparring buddies. Majestic, we both thought. The only thing missing was, of course, the horses. The east, now light from the rising sun, taunted us. We both felt a little disappointed, though we we were grateful just to be immersed in such beauty. We knew the horses were there. The running of the ponies from Assateague to Chincoteague that had happened a day ago, just 30 miles south of where we were, had no impact on the horses we were looking for. 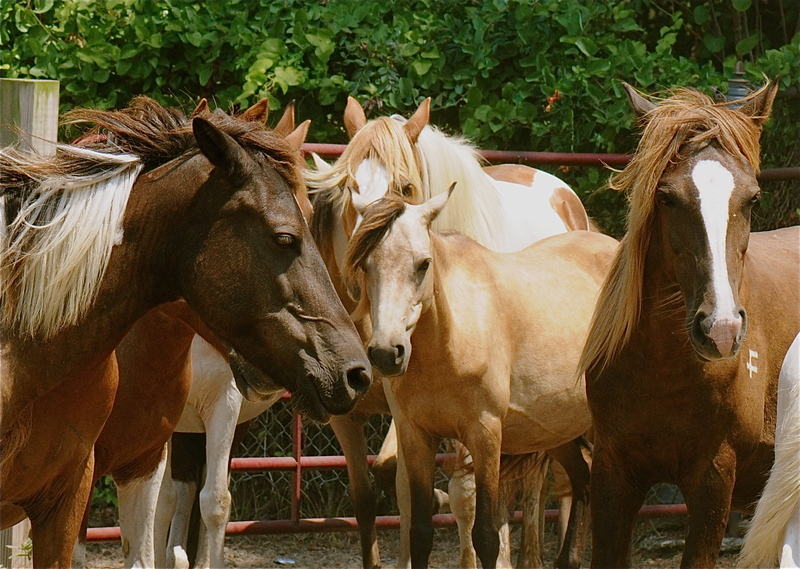 A fence separates the Maryland and Virginia wild horses, and Maryland controls the horse population a little differently than Virginia’s annual pony swim and auction. 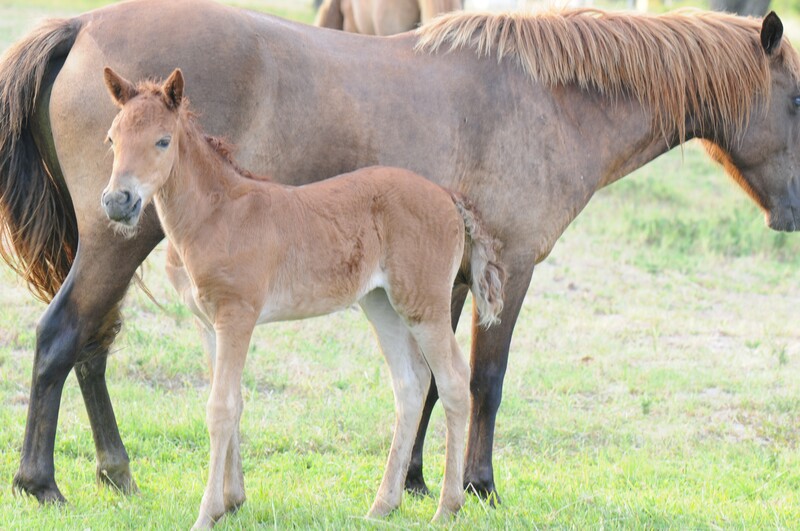 North of the line, Marylanders use dart guns to administer contraceptive vaccines to selected mares. Simply put, we knew they were there. We just had to find them. We decided to zig-zag it through the primitive camps. Maybe they had a morning routine of their own, seeking out sweets and treats left out or behind. 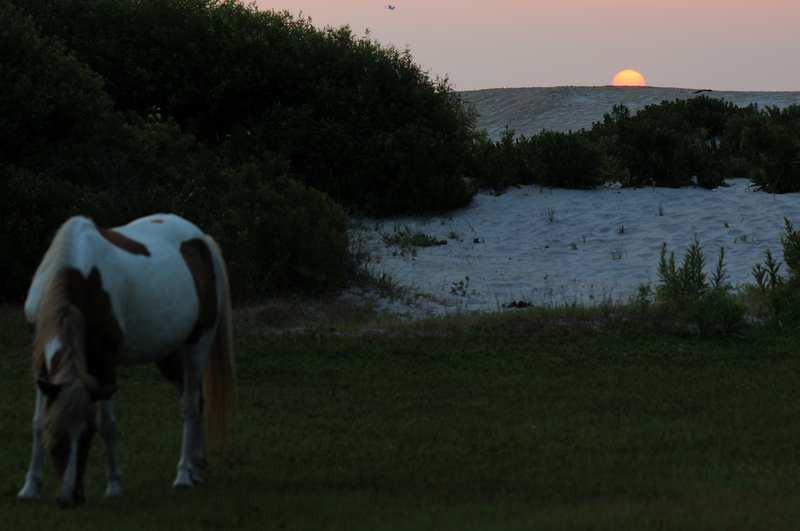 The sun had since broken the horizon on the Atlantic, but the high dunes kept it hidden from us as we sought out the ponies. 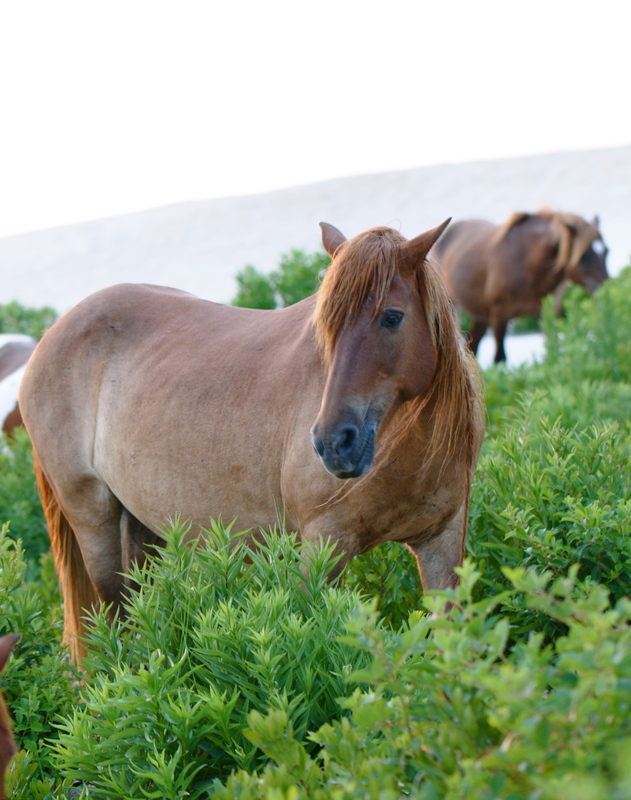 On our third and final sweep of the camps, I noticed a few pintos and chestnut-brown ponies emerging from the dune grasses and wandering through the campsites. As quietly as possible, we gathered our gear and headed toward them. We started shooting just as the sun’s second rising — this time over the dunes — began. We made it after all. As the ponies grazed, we kept shifting to the right, doing our best to capture them in purely natural settings and away from the asphalt roads, the picnic benches, and the very unnatural and unsightly bath house building. Brad, to my right, had made his way through the tufts of marsh grass and beyond the camps to get a better view of the ridge line. 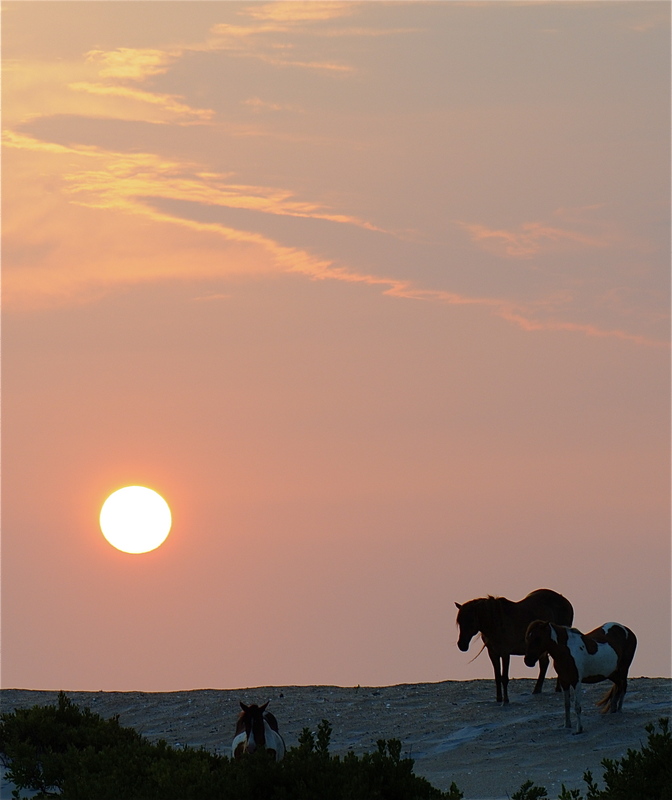 There, silhouetted against the big orange sun, were six or seven ponies at various levels. Our patience had paid off. We stayed there for twenty minutes or so, experimenting with various combinations of apertures and shutter speeds for different lighting effects. The horses, as if scripted to stay on the dunes for as long as we were shooting, posed with natural magnificence and grace. We packed up our gear and headed back toward the main highway, grateful to have lived so fully, so early in the day, when most of the east coast still slept. We were about 500 yards from turning left and then off the island when we spotted a mare and her foal. The bond between the two was unmistakable as we pulled off to the left side of the road and approached them. The foal, only days old it seemed, shifted her weight nervously with little strength in her baby legs, never leaving her mother’s side. 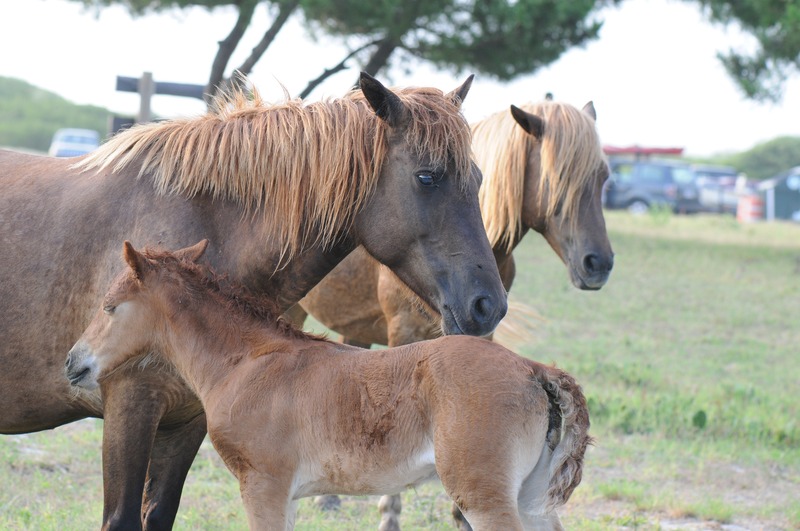 After a few minutes, a stallion joined them, as if to make sure that we wouldn’t harm the mother and baby. We did not challenge, of course. We kept our distance, in our own personal reverence, of the inseparable bonds between a mother and her child. We headed home, humbled by the experience. A few hours later, Amy and I loaded the kids in the Jeep and headed to Chincoteague to witness the penning of the ponies from yesterday’s run from Assateague. Madelyn was especially excited. She has been a “horse girl” since she was two, and she knew all about the pony run from reading Marguerite Henry’s Misty of Chincoteague. I didn’t know much more than the horses were corralled on the southern tip of Assateague, brought over to Chincoteague through the wildly popular 3-minute pony swim across the channel separating the two islands, and then auctioned. There was a carnival, too, which we were all looking forward to. When we arrived and parked across the street from the fairgrounds, we were immediately disappointed that all of the carnival rides and buildings were shut down. We roamed through the grounds like post-apocalyptic survivors, aware that something great had happened here — and recently — but there was no sign of life anywhere. We kept walking toward the abandoned rides tucked in the back of the fairgrounds, and it was Madelyn who first spotted them. 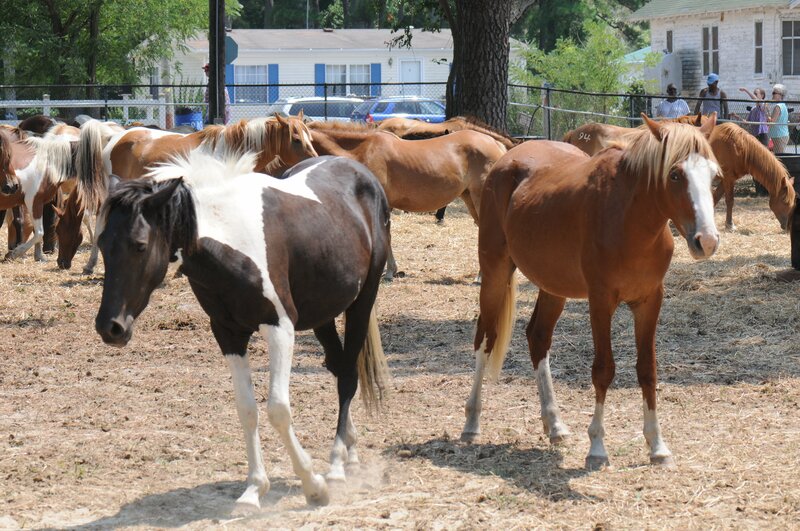 Wild ponies, mostly mares, penned up in a dusty patch of land just beyond the lifeless rides. We had just missed the auction. To our left, a line formed where the winners were paying their winning bids, money that would benefit the local volunteer fire departmant. 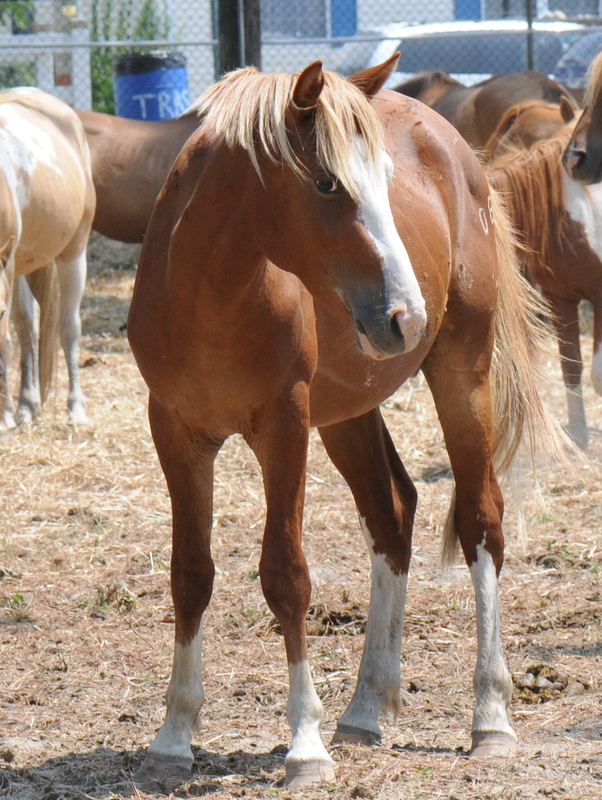 Most of the horses went for about $700, but some went as high as $8,000, we were told. These were beautiful horses, but there was a restlessness about them that I couldn’t place, a restlessness that somehow transcended the trauma of being corralled, run through the channel, and then penned. There was something else, a sadness of sorts, that I did not understand. And that’s when we heard them. The auctioned foals, on the other side of the line of winners, had been separated from their mothers. They whinnied to them, a neverending chorus of cries like I’ve never heard before. I immediately reflected on the mother-child bond I had witnessed just hours earlier on Assateague Island. I had seen that love intact, unmistakable and strong. There was no doubt in my mind that this family, untouched by any such stresses that we place on ourselves as human beings, was a natural love, so perfect and divine, that we could not question the depth and sanctity of relationships founded in love. We left minutes later, kicking at the dusty grounds of the barren carnival that wouldn’t come to life until the sun had nearly set. For our kids, hunger replaced the disappointment that we were going to miss the carnival. For me, though, all I could do was think about the foals, their sorrowful whinnies fading as we left the carnival and crossed the street to the parking lot. I reflected on their freedom that they have had on these islands since the early 1600’s and wondered how they had been able to manage so well without our intervention for hundreds of years. Was it our place to step in, break the familial bonds of love, and claim the foals as our own, a piece of property purchased for a few hundred dollars?